Based in Seattle, Simply Bella Baby, designs custom baby products that are stylish, functional and meant to last countless hard-wearing hours of use for today’s baby. Silly rabbit, crafts are for kids! Paint the toilet paper rolls pink and set aside to dry. Cut two bunny ear inserts, smaller than the white ones. Cut two eyeballs, larger than the white ones. 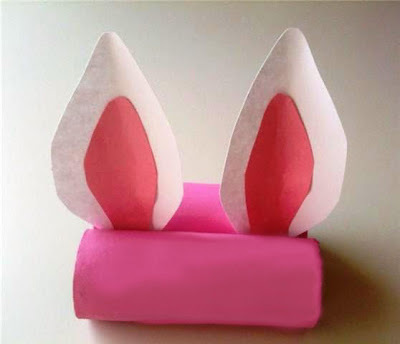 Glue the pink ear inserts on top of the white ears and then glue them in the middle of the two toilet paper rolls securing them and the two rolls together to form the body of the rabbit. Glue the two white eyes on top of the black eyes and glue them to the front of the rolls, equally spaced apart. Glue on the teeth just below the eyes in the center of the front roll. Glue the whiskers on top of the upper part of the teeth and then the cotton ball on top of the teeth for the nose. 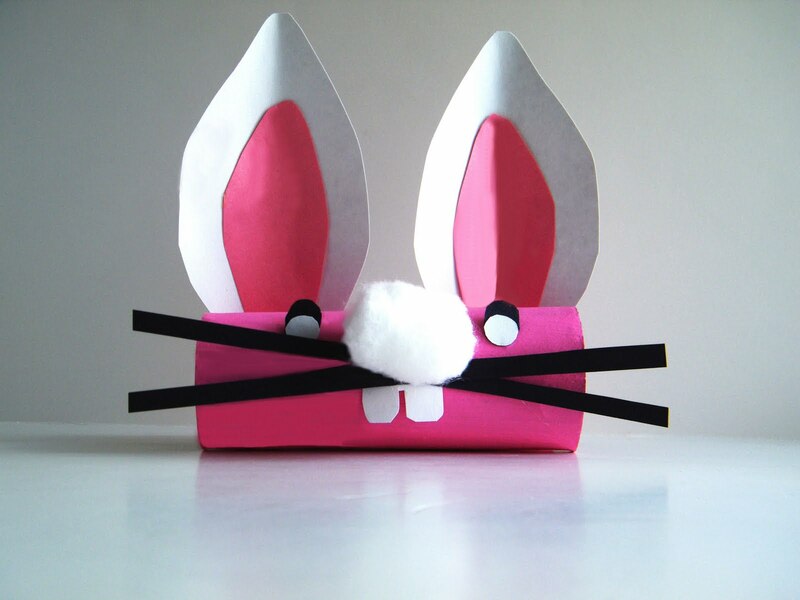 *You can add another cotton ball on the back of the rolls for a bunny tail. 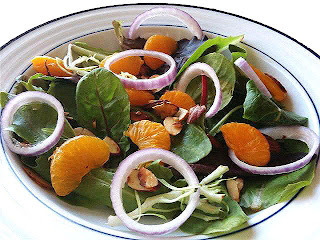 It's a light and tasty salad for the spring! Saute' the almonds in the butter until golden; set aside. Combine in the lettuce, oranges and almonds and toss well. I am hoping to launch my new store on the web very soon and I would like all my loyal customers, followers and fellow Tweeters to follow along with me on my new adventure. At some point I will be switching over to my new company name, Simply Bella Baby. In celebration of my new adventure I am offering a chance to receive one of my bibs for FREE! Become a new follower on my NEW blog, Simply Bella Baby and you will earn ONE entry! Become a new follower on Twitter @Simply Bella Baby and tweet about the give-away and you will earn ONE entry. Visit Amy Rose Designs and leave a comment on the new blog about your favorite item in my store with the product link, and you will earn ONE entry. You have THREE chances to win a FREE bib, of your choice, in my store. 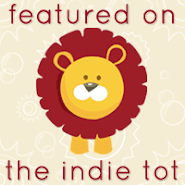 Be sure to leave a separate comment on the NEW blog for each entry! You can click on the names above to take you to all the places to earn your entry. With the winter months finally behind us and spring already making its presents known , the warmer weather has inspired me to do a thorough cleaning of my home. Having had the house closed up for the cooler months it feels as if the dirt has settled into all the nooks and crannies, even though I clean every week. This is also the time of year that has my family slaves to our allergies. With allergies and a very low tolerance for the cleaning supplies our local market has on their shelves, I had to find another way to attempt my planned spring cleaning. Then it hit me. "What did my mother and grandmother use when they cleaned?" Then I remember our home smelling like Easter and homemade lemonade. They used products that were readily available at the market, and still are today, and used them to make their own cleaning products. This is not a new concept by any means, but we are used to a "take it off the shelf and go" mentality that we don't think about the harmful things we do to ourselves every time we use these products that are suppose to be better, faster, easier. Today the madness stops! Today I commit myself to take the time to make the same homemade solutions that were good enough for my mother and good enough for my grandmother. I will no longer use the brand products to clean my home in the past and in return I will have a healthier home and a healthier me! My pocket book will also thank me later. *With anything; use caution while handling cleaning products of any kind and be safe while doing it. I love these cupcake toppers! 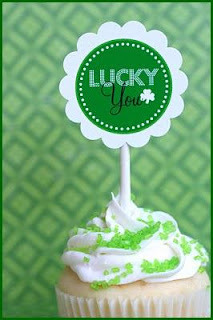 Kim, from TomKat Studio, is offering these party toppers for FREE for St. Patrick's Day! Just download the file or print right from your computer and they are instantly there for you to decorate your treat bags, make a gift card or top the cupcakes for your child's school party. 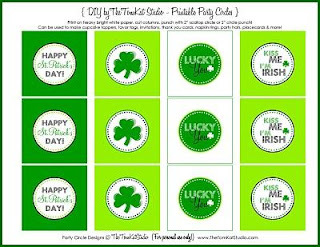 Whatever you end up using them for they will finish the look of your St. Patty's Day project. You can find the download HERE! If you are looking for a great way to showcase your child's birthday party or your planning a 40th birthday party, Kim has something for every occasion. The Perfect St. Patrick's Day Dinner in the Crockpot! Place the corned beef into the crockpot and cover the top with the pepper corns and bay leaf. Cut up the onion and place into the crockpot. Pour enough water into the crockpot to cover the corned beef for cooking. Cover and cook on low for 6-8 hours or on high for 4-5 hours. The last hour to hour and a half of the cooking process place the carrots and potatoes into the crockpot to cook. 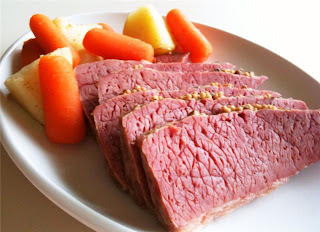 Pull the corned beef out of the crockpot and allow it to cool on a wooden cutting board for 5-10 minutes before cutting into slices. Serve with the carrots and potatoes. Trace your child's hand on all of the colored construction paper, except the black. Cut them out and set aside. Using the black construction paper; draw and cut out the shape of a black pot. 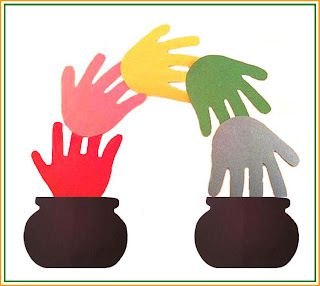 Glue the hand in the shape of a rainbow using the color formation of a rainbow. Glue the two post on the bottom two hands of the rainbow. Hang on a door or window or add some more flair with stickers and glitter and gold coins on the pots. Don't have the decorating "thumb"? 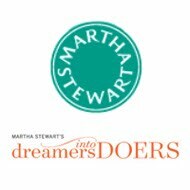 Pottery Barn Kids is offering a FREE decorating classes this weekend to help you with the look of your baby's nursery. I myself have several pieces in my own home and love them. Their store staff is always helpful and knowledgeable about their products with a great eye for detail. Take advantage of a great opportunity that is free to you! Search HERE for your local store! *I am in no way affiliated with Pottery Barn or their stores as they are no way affiliated with me.